Allen Wickell Wins Friday $25K At The Million! 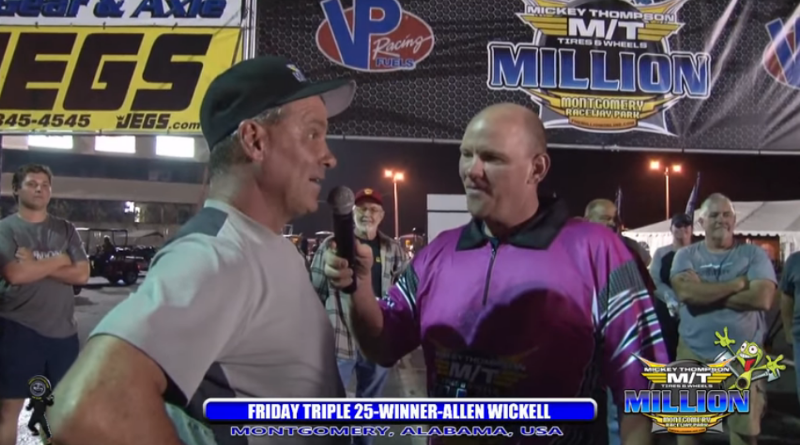 MONTGOMERY, Ala. – The 23rd Annual Million Dollar Drag Race crowned its second $25,000 winner of the week on Friday after Allen Wickell, Saraland, Ala., outlasted a field of more than 620 of the best bracket racers in the country. Wickell defeated a red-lighting Jamie Bridge, Ontario, Canada, in the all-dragster final round. After the doorcars dominated the Thursday $25K event, the dragster crowd took control on Friday with an all dragster final round. The doorcars did represent well as there were two doorcars alive at five cars and one in the semifinals. The lone semifinalist was Joey Anderson driving his early model Camaro. Anderson fell to event winner Wickell in the semi’s. Thursday night’s $25,000 winner Adam Davis drove his Nova to five cars before falling to Anderson. Lane Dicken and his ultra-quick dragster also made it to five cars where he turned it red to Jamie Bridge. After two $25,000 to win events on Thursday and Friday, the intensity at Montgomery Raceway Park will ratchet up a few notches on Saturday with the 23rd Annual Million Dollar main event where one lucky racer could walk away with a million dollar paycheck. Click here to watch all the big money bracket racing action live online. For more drag race results from the Million, click here for Wednesday results and here for Thursday results. Visit DragChamp daily for complete big dollar bracket racing coverage from the Million Dollar Drag Race. ← Adam Davis Wins $25K Thursday At The Million!